Relevant Link: Don O’ Leary is an Orange County Resident Running for County Comissioner in 2016, he also has a lot of great, relevant videos/articles at his site. I happen to know that the propaganda surrounding its efficacy as a preventative health measure came directly from the health & human services department of our federal government, and secondarily through the public health departments of the respective states…Then on downward to each county. Generally speaking the states’ position has amazingly not changed much in the last 60 years, despite all of the evidence which has come out on the practice since it was first instituted in the late 1950’s. I was present earlier this month before the board of commissioners of orange county to provide a common sense approach to why this policy should be reversed IMMEDIATELY. I am e-mailing you because I understand this issue has now been brought to your attention by the commissioners & they are waiting for some advisement from you & the board of health of orange county. So I would like you to please consider the following as common sense reasons why this policy should end. Nobody in the history of public water fluoridation has ever debated the fact that the alleged purpose of the policy is to help prevent tooth decay. (g)(1) The term “drug” means (A) articles recognized in the official United States Pharmacopoeia, official Homoeopathic Pharmacopoeia of the United States, or official National Formulary, or any supplement to any of them; and (B) articles intended for use in the diagnosis, cure, mitigation, treatment, or prevention of disease in man or other animals; and (C) articles (other than food) intended to affect the structure or any function of the body of man or other animals. § 106-145.6. Denial, revocation, and suspension of license; penalties for violations. of this Article or for conviction of a violation of any other federal, state, or local prescription drug law or regulation. Chapter 150B of the General Statutes governs the denial, suspension, or revocation of a license under this Article. It is unlawful to engage in wholesale distribution in this State without a wholesale distributor license or to violate any other provision of this Article. A person who violates this Article commits a Class H felony. A fine imposed for a violation of this Article may not exceed two hundred fifty thousand dollars ($250,000). Lastly – drugging the water supply in such a manner violates informed consent laws, which require the patient to be informed & to give their explicit consent before accepting a medical treatment like fluoride. It may also violate certain individual’s freedom of religious expression since some religions forbid consumption of toxins such as fluoride. If they don’t even know fluoride is added to their water they could be unwittingly committing blaspheme! These basic rights should be respected & protected by the county, not deliberately destroyed. The precautionary principle or precautionary approach states that if an action or policy has a suspected risk of causing harm to the public or to the environment, in the absence of scientific consensus that the action or policy is not harmful, the burden of proof that it is not harmful falls on those taking an action.The principle is used by policy makers to justify discretionary decisions in situations where there is the possibility of harm from taking a particular course or making a certain decision when extensive scientific knowledge on the matter is lacking. The principle implies that there is a social responsibility to protect the public from exposure to harm, when scientific investigation has found a plausible risk. Colleen – There is no scientific consensus that fluoride is harmless. In fact quite the opposite.I challenge the board of health to bear the burden of proof that consuming fluoride through the water supply is NOT harmful in any way. This is a rhetorical challenge because it is impossible for your board of health to do it. Even the promoters of fluoridation have admitted that drinking fluoride will inevitably cause some degree of dental fluorosis which is the outward manifestation of systemic overexposure. This is well reported by the center for disease control. Fluorosis shows up as white spotting & mottling of the dental enamel. Therefore it can not be refuted that fluoride is detrimental & thus – does not comply with the precautionary principle & should not be a policy! I appreciate your consideration to this critical public health issue & would like to offer my contact information if you have any questions or concerns about this inquiry. 2) Water fluoridation decisions are made by the entities that provide municipal water. The largest municipal water supplier in Orange County is OWASA and they just this year voted to continue fluoridating their water. Therefore my recommendation to the Board of County Commissioners (and also my recommendation to the OWASA Board when they asked) is that they support the very important, safe and effective public health practice of fluoridating municipal water supplies. Thank you so much for bringing this issue to our attention. We can miss important health issues affecting our community and need active residents like you to make sure we are always staying on top of the myriad health threats that we face. I will continue to monitor the emerging research on the health effects of fluoridating municipal drinking water and if I see any reason to revisit this recommendation, I assure you I absolutely will. 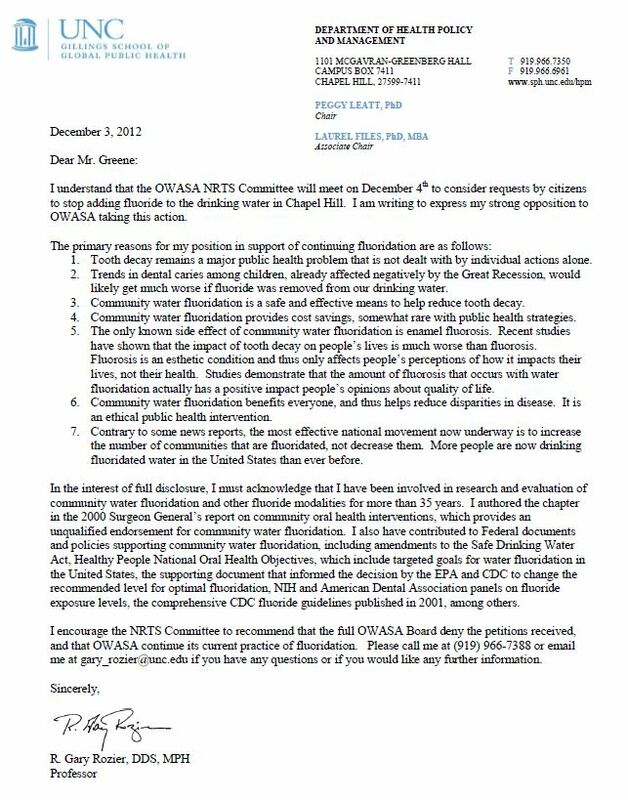 I was recently notified by the Orange County Health Director Colleen Bridger that she & the health department are publicly endorsing the idea of public water fluoridation in response to some recent petitions that the government stop this practice immediately. After reviewing Colleen’s statement, she appears to be using the attached letter authored by you in 2012 together with several other stated endorsements from various organizations. I am mailing you Gary because I gather from your letter that you are a highly educated & knowledgeable person on the various machinations & applications of governmental policy, which may result in a city applying a policy like water fluoridation to the population. I also gather that you sincerely believe that this is an appropriate role for government to play, which is a legitimate position to have if you’re honest about it, which I gather you are being. It is for these reasons I am interested in conducting an interview with you on the topic of health policy & public water fluoridation. Would you be willing to participate? This might be a good opportunity to illustrate to the public why public water fluoridation should be maintained – so I hope you will seize this opportunity. Let me know your thoughts, & if you’re interested we can worry about logistics.